Giving Tuesday is a global day of giving to non-profits that follows the hectic days of Black Friday and Cyber Monday. On this day (and from now until the end of the year) would you consider donating to us? Research proves over and over again that high-quality early childhood education makes a big difference in the life of a child. In addition to strengthening socialization skills, pre-school provides a place where a child can gain a sense of self, explore, play with peers, and build the skills they need to enter Kindergarten. But high quality early childhood services are expensive. As with most schools, our tuition does not cover the cost of care, let alone classroom supplies and equipment. Almost half of children served by SUMMIT Early Learning live in or near poverty and many working families struggle to pay for child care so they can keep their jobs. Gifts to our organization are not only greatly appreciated, but essential to sustaining the quality and depth of our programs. $25 will buy a month's worth of gas to drive their child to Head Start/Early Head Start classes. $150 will help pay for a single mother's driving lessons so she can get a job. $250 will buy new materials for a classroom or a scholarship for a former Head Start student to attend college. That's just about $20 a month!! We invite you to contribute in a way that is meaningful for you and your family. The agency and the staff of the Selinsgrove Children's Center are so amazing! Always there when we needed them! A great agency that really cares about the children. It's often hard to fully express how much of a blessing Summit is to our family and to so many others in the community. THANK YOU a million times! Proud to be a part of this organization. Grateful for the wonderful teachers and staff and all that they do for the kids. Children are our future. Caring for children should be one of the main focus in every community. 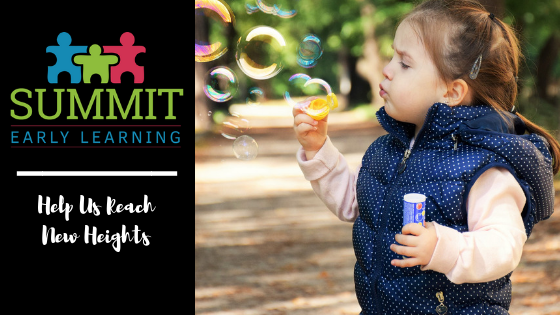 We're so thankful for the teachers and programs at SUMMIT Early Learning! The hands-on activities and caring staff set kids up for future success! Miss Lisa has been instrumental in the education of our children. Her love of teaching goes beyond her classroom and she is an asset to SUMMIT! Josh Wagner provides incredible learning opportunities through the Makerspace; thank you for the opportunity to support this organization!